Caring Hearts is pleased to announce its recent ranking as one of the top places to work for caregivers, companions, and nurse aids. 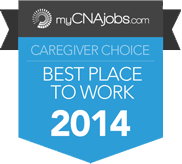 Caring Hearts is one of only 10 agencies selected in the recent myCNAjobs Caregiver Choice Awards program. Since 1997, Caring Hearts has been a leader in home care services. We now service more than 600 communities across the country. To learn more, visit the Caregiver Choice Awards website. Founded in 1997, Cincinnati-based Caring Hearts is one of the nation’s leading senior care franchises specializing in comprehensive home healthcare and companionship for seniors, new mothers, those recovering from illness or injury and individuals facing lifelong challenges. Caring Hearts currently has a presence in more than 600 communities across North America and is seeking qualified franchise candidates in strategic communities throughout the country. Caring Hearts was recently ranked the #1 Senior Care Franchise and “Best of the Best” by Entrepreneur magazine for the fifth straight year and continues to lead the way in the senior care industry. Caring Hearts is affiliated with Direct Link, a provider of medical alert units, including 24-hour personal emergency response systems, an automated medication dispenser and vital signs monitoring units that enable seniors to feel safer and live independently at home for longer than might otherwise be possible. For more information on Caring Hearts and franchising opportunities, visit the Caring Hearts website.